This year on Saturday October 3rd 2015 we will be walking in one of the most important photographers of the nineteenth century Julia Margaret Cameron’s (1815-1879) footsteps. Our annual IWDIG Photowalk as planned to coincide with the bicentenary celebrations of Julia, now celebrated as a pioneering portraitist will take place around Freshwater Bay. As always, the event is free to attend. There are still a few places available so if you’d like to meet and swap ideas with other photographers and checkout some of the latest Elinchrom gear you must reserve your place now at: www.kelbyone.com/photowalk click on Join This Photo Walk. 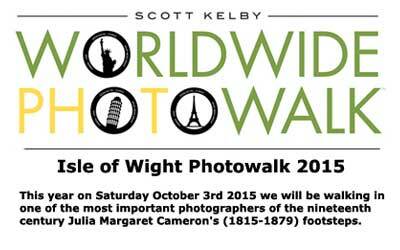 As part of the Julia Margaret Cameron Bicentennial celebrations the 2015 World Wide Photowalk, Saturday 3rd October, will focus on Dimbola Museum & Galleries the pioneering Victorian photographer’s former home. Organised by the Isle of Wight Digital Imaging Group (IWDIG) walkers will meet at Dimbola 10:30 am for an 11:00 am start. The walk will last around 2 hours with plenty of opportunities for photo taking. The walk will finish at Dimbola where the tea room will be open for light refreshments. For walkers interested in trying out the latest Elinchrom Lighting equipment the studio will be open with photographers available to answer your questions. Don’t worry about the weather as it’s looking fine for the coming weekend. We are looking forward to seeing you on this year’s walk so register now.